Tropical Garden 2BR apartment in Vinhomes Central Park - Ho Chi Minh city, boasting an outdoor swimming pool, is located in Ho Chi Minh City, 4.1 km from Saigon Opera House and 4.2 km from Ho Chi Minh City Hall. This apartment is 4.4 km from General Post Office and 5 km from Diamond Plaza. This apartment features a flat-screen TV, a seating area, a kitchen with a microwave and 2 bathrooms with a hot tub. The apartment also offers 2 bathrooms with a shower. Guests can make use of the fitness centre. This property offers a barbecue. Jade Emperor Pagoda is 5 km from the apartment. Tan Son Nhat International Airport is 15 km away. When would you like to stay at Tropical Garden 2BR apartment in Vinhomes Central Park - Ho Chi Minh city ? Each day we'll check prices and send you an email for your selected dates at Tropical Garden 2BR apartment in Vinhomes Central Park - Ho Chi Minh city. If you don't have specific dates but would like to check prices for say next weekend or say next month we can check the price too. 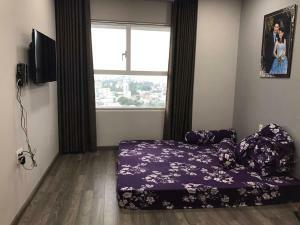 Click to write a review and share your experience of Tropical Garden 2BR apartment in Vinhomes Central Park - Ho Chi Minh city with other travellers.